NEW Truly Invincible by name and nature, a pear which will never let you down! You have never known a pear like it! The reason Invincible is so reliable is because, uniquely it produces 2 sets of blossom. So, during late frost years it will still produce a crop, when every other pear tree around is barren! The further advantage of this is that, if late frosts do not occur, Invincible will set 2 separate crops which then mature over a very long picking period. It is not unusual for Invincible to he harvested from the lst week of September to the 2nd week of October, and in storage they last and last, until February and beyond! Simply place the fruits in a fridge and take them out a few days before you wish to enjoy them. At first the fruits are crisp and juicy, but when allowed to ripen fully the flesh becomes succulent and tender, and at all times is blessed with a sweet and very more-ish flavour! The skin colouring is a rich and clean looking emerald green, yellowing slightly when fully ripe. The shape is very even with a high percentage of class 1 fruits, the effect of all these perfect large, vibrant pears is of so many huge emerald droplets clustered on the branches! You will never have known a pear like it. 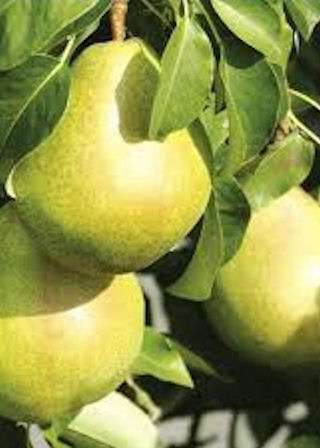 Invincible - a triumph in breeding ultra hardy pears for English gardens. Highly recommended. Named and introduced by Chris Bowers & Sons. Price: Please add £1.00 to the price of each tree of Invincible ordered. A limited number of trees are available for despatch. Early ordering strongly advised.